In practice, this means following a healthy diet that is high in plant foods (vegetables, fruit, and legumes), and low in processed meats and alcohol. Processed meats to avoid include those that have been smoked, cured or preserved, such as hot dogs. Bourgeois recommends trying to include an adequate amount of vegetables and fruits in daily diets as well. The Canada Food Guide recommends that for women over 19 years of age, this translates to around seven to eight servings per day of fresh or frozen vegetables. In real terms, this can be achieved by filling up half of your lunch and dinner plates with vegetables, and including fruit at breakfast. Group-based nutrition classes and even a cookbook are available for those looking for more information on how to build this into their routine. To get a sense of how to maintain a healthy bodyweight and get the right amount of exercise, there are also physical activity tips. For alcohol, whether it’s wine, beer or liquor, consumption has been linked with both premenopausal and postmenopausal breast cancer and there is no known safe level. In general, the Canadian Cancer Society recommends no more than one drink per day for women. Soya products on the other hand, have had a mixed discussion around their effects. Studies have shown that eating moderate amounts of soya does not increase breast cancer risk – this means around two daily servings of whole-soy foods like tofu, soy milk or the actual soy beans themselves in edamame. Although not directly linked to cancer, it’s also recommended to put limits on sugar-sweetened beverages to support a healthy weight. For women undergoing treatment for breast cancer, Bourgeois advises maintaining a varied diet, maintaining calcium and vitamin D as some medications and treatments are known to impact bone health. It’s also good to ask your oncologist or care team about which vitamins or herbal supplements should be avoided, as some can interfere with chemotherapy medications. 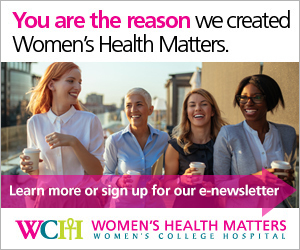 More advice and information on this is also available from the Peter Gilgan Centre for Women’s Cancers at Women’s College Hospital, in partnership with the Canadian Cancer Society. Special thanks to Behnaz Abedi, RD, Clare Andersons, RD, Helen Emanoilidis, RD, and Janis Rusen, RD, for their input on this piece.